Altmetrics offer new and powerful ways to track research impact and engagement beyond traditional methods like citation counts and impact factors. Read about our experiences as an early adopter of the ‘Altmetric for Institutions’ application on the Altmetric blog. And if you’re on campus then check out the application by visiting Altmetric Explorer. In undertaking research on any topic it is always a good idea to ask the question: is this research feasible? Often a student has decided on a particular area of research, for laudable reasons, such as seeking employment in this area. However, to do so without guidance from a librarian can be problematic. If concerns about whether it is possible to obtain the data, how difficult it is to use a database, or time constraints have not been considered, their data collection may be made more difficult than it needs to be. From experience, the following scenario is common: a student seeks assistance in collecting data for their MSc dissertation after agreeing a research topic which would be beneficial to the area of work they hope to go into. Having read an article in an accountancy journal they decide to undertake similar research to that detailed in the article. When starting data collection, they contact the library for help with the specialist financial databases – but they may encounter unexpected restrictions. Datastream: a database commonly used in financial research. Technical Terms: I am often bamboozled trying to understand unfamiliar terminology, not having a degree in finance/accountancy. After questioning the student about their research, it can become apparent that they don’t know what they’re talking about either! For example, they may ask for ‘Risk Free Rate data’ from Datastream. There is no such datatype in Datastream – but there is something which is often used to represent this concept (three month Treasury Bills). Timing: This is pertinent. Having established that the basis of their proposal was to replicate research in a journal article, the fact that the academic probably took two years or more to complete their work means it would not be feasible to complete in the three months allotted to a student’s MSc dissertation. Location: This can restrict choices. Where students are off-campus (distance learning), certain databases are not accessible due to licensing terms, meaning required data is not available. Numerous sessions are delivered each semester (eg Mergers and Acquisitions, Researching Quoted Companies), providing assistance in using specialist financial databases, to help students gain competence in searching databases. Through these regular drop-in sessions, students can discuss their requirements and confirm the best options for obtaining data. Where it is clear that the complexity of a student’s request could not easily be accommodated in a Research Consultation (which may have many students requiring assistance), it is possible to set up one-to-one training, to devote more time to an enquiry. These allow extended support and the flexibility to fit in with the student/librarian’s other work commitments and any preparation needed on the part of the librarian. Establishing the feasibility of research provides a valuable service, taking advantage of the accumulated knowledge and experience of those in the Business Data Service, for the benefit of students at The University of Manchester. The opeNWorks project held its first workshop in early December. 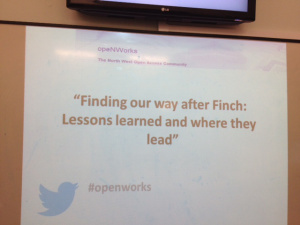 We called the session ‘Finding our way after Finch: lessons learned and where they lead’ as the early focus in our project had been on the experiences of the project partners in supporting Open Access (OA) since the launch of the RCUK OA policy. 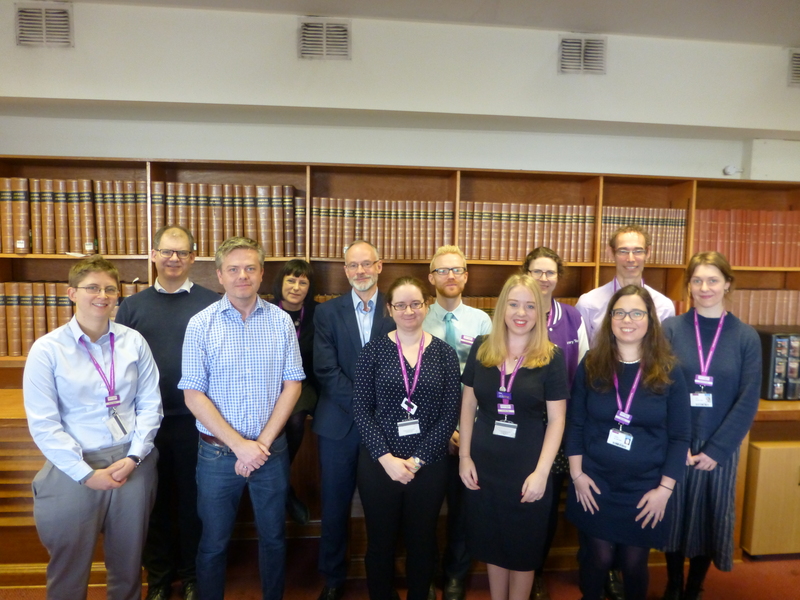 The opeNWorks project team draws together colleagues from a number of universities based in the North West with the aim of developing a regional community of good OA practice. The North West is home to various ‘categories’ of university and the workshop provided a forum for gathering concerns as well as understanding strengths from each type.